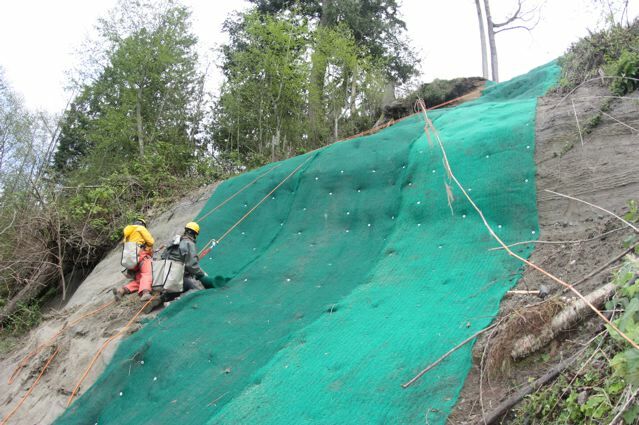 Most Turf Reinforcement Mats (TRM's) are synthetic fiber erosion control blankets that offer permanent support to vegetation. TRM's combine vegetative growth and synthetic materials to form a high strength mat that helps prevent soil erosion in drainage areas and steep slopes. Erosion control systems that incorporate TRM's allow supported vegetation to be utilized in situations where unsupported vegetation would be washed away. In highly erosive situations where hard armor solutions such as riprap or concrete are being considered, a soft armor solution involving TRM supported vegetation may be an alternative. TRM's are stapled onto the ground over the area that has been seeded and fertilized. As the vegetation grows through the TRM, the TRM provides erosion protection, a microclimate for seed germination, and protection of the immature plants from mechanical damage. Less concerned about flow, but rather just dealing with steep slopes?